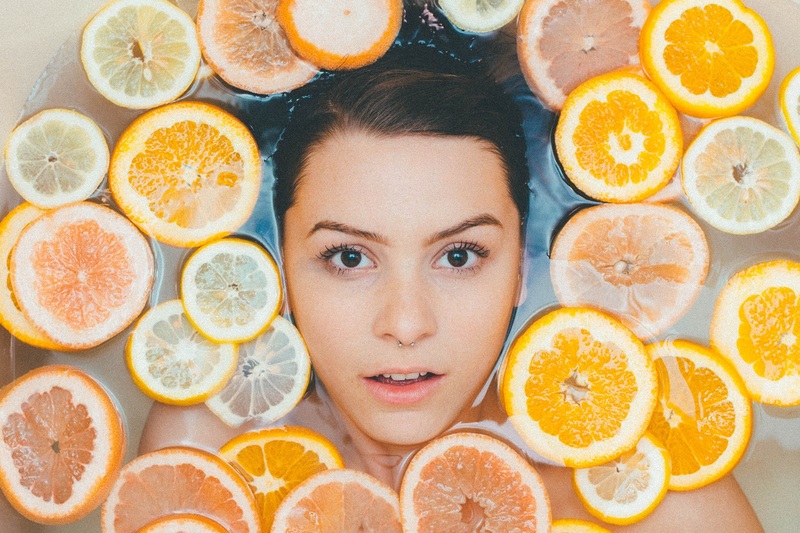 Natural Skincare For Healthy, Glowing Skin! One is always on the lookout for that “miracle cream” that will make our skin glow and make us fair. Most of us in the literal sense, abuse our skin. We expose our facial skin to various creams, lotions and skincare treatments. No matter how we take it, our skin regulates our body’s temperature, protects us from bacteria and viruses that cause infectious diseases. We often give much attention to our facial skin for obvious reasons. But, we should definitely try to maintain and keep our entire covering (skin) healthy rather than focusing only on the face. There are many superficial skincare treatments available in the market to bring a glow to your skin. However, as a dietician, I will be showing you ways to keep your skin healthy by foods found in your kitchen itself. You will be surprised to know that there is a strong link between the food you eat and the health of your skin. Your food choices are literally reflected on your skin! Vitamins like B complex, A, D, E, and C are known to play an important role in maintaining healthy skin. They have chemicals called photochemicals which help in preserving the body from various bacterial, viral and free radical invasions. They also have anti-oxidant properties which helps the skin from the oxidative damage caused by stress, pollution and the body’s own reaction. Drink fresh fruit juices. Try a different juice every week. For instance, juices you could try include Cranberry, blueberry and orange juice, etc. Supplementation helps in maintaining healthy skin. Apart from the cosmetic point of view, many dermatologists now recommend nutritional supplements to tackle issues like acne. Supplementation of multivitamins and omega 3/ fish oil capsules have shown positive effects on skin. Supplementation is needed when a person’s daily requirement of a certain nutrient is inadequate. Hence, before starting off with any nutritional supplement, consult your dietitian. As mentioned above, the kind of food we eat reflects on our skin. Junk food, fatty foods, carbonated drinks, alcohol, and refined products affect your skin. This can be attributed to the fact that these foods have a negative impact on health by hindering the absorption of certain nutrients. Also smoking can accelerate the aging process, causing wrinkles even before time. This is tried and tested all over and also considered as a “Gharelu Nuska” – meaning home remedy. Drinking enough water and maintaining good hydration retains the moisture of the skin. Drinking adequate water clears out toxins and waste from the body keeping it healthy. This is indirectly seen through the skin. Ever wondered why you can see acne on your face when you are stressed? Research has shown a positive link between stress and its effects on the skin. Getting a good night’s sleep and de-stressing yourself from everyday routine can be helpful and can also improve your skin. Insufficient sleep causes dark circles around the eyes. Early morning yoga outdoors will not only reduce your stress level but will also give you your daily dose of Vitamin D. There is a research that shows a strong link between stress and skin ageing. I am sure nobody wants to look old, right? Try de-stressing yourself every time you find it’s taking a toll on your health. It is the key to healthy skin! We are well aware of the benefits of exercise and cardio respiratory fitness, but little do we know about its effect on the skin. Regular exercise helps in regulating blood flow to our body especially the skin. Blood not only carries oxygen but it also carries nutrients to our cells. By increasing the blood flow, exercise nourishes skin cells, keeping them healthy and vital! Nutrition is one the important components that modulate the vibrancy of your skin. As a dietician, I believe we should stop taking our skin for granted. We need to think beyond creams, make ups and laser treatments. Nourish your skin not through chemicals but with proper nutrition, regular exercise and good sleep!